TORRANCE, Calif., Jan. 5, 2010 -- Toyota Motor Sales (TMS), U.S.A., Inc., today reported December sales results of 187,860 units, an increase of 22.9 percent over the same period last year, on a daily selling rate (DSR) basis. On a raw volume basis, unadjusted for 28 selling days in December 2009, compared to 26 selling days in December 2008, TMS sales were up 32.3 percent for the month, compared to the same period last year. For the year, TMS reported annual sales of 1,770,149 vehicles, a decrease of 20.2 percent from the same period in 2008, on a DSR basis. With 308 selling days in 2008 and 2009, annual sales were also down 20.2 percent on an unadjusted raw volume basis. Toyota Division recorded year-end sales of 1,554,174 vehicles, down 20.6 percent from the prior year. Lexus reported sales of 215,975 units in 2009, down 17 percent from 2008. 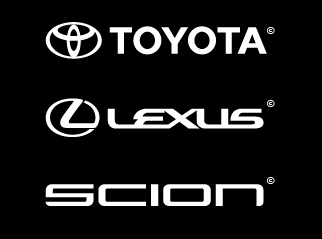 Scion Division reported sales of 57,961 units for the year. "Emerging from the rollercoaster of 2009, the industry has gained positive momentum for a gradual recovery," said Don Esmond, senior vice president of automotive operations, Toyota Motor Sales, U.S.A.	"Despite a tough market, TMS performed solidly, reaching its goal to grow market share. With Toyota continuing as the best-selling overall brand and Lexus as the best-selling luxury brand in America, we're looking forward to a bright 2010." Toyota Division reported December sales of 159,295 units, up 24.7 percent over December 2008. Toyota Division passenger cars recorded December sales of 98,122 units, up 34.6 percent over the year-ago month, with year-end sales of 996,431 units, down 17.4 percent from last year. For the year, passenger car sales were led by Camry and Camry Hybrid, which posted combined annual sales of 356,824 units. Corolla recorded 2009 sales of 296,874 units. The Prius mid-size gas-electric hybrid posted year-end sales of 139,682 units. Venza reported sales of 54,410 units for the year. Toyota Division light trucks reported December sales of 61,173 units, up 11.7 percent over December 2008, with year-end sales of 557,743 units, down 25.7 percent from 2008. For the year, light truck sales were led by the RAV4 compact SUV with year-end sales of 149,088 units, up 8.8 percent over the same period last year. Highlander and Highlander Hybrid posted combined annual sales of 83,118 units. The Tundra full-size pickup recorded year-end sales of 79,385 units. The Tacoma mid-size pickup reported sales of 111,824 units for 2009. Sienna recorded year-end sales of 84,064 units. Scion reported December sales of 3,771 units, with year-end sales totaling 57,961 units. The Scion xB urban utility vehicle recorded year-end sales of 25,461 units. The tC sports coupe reported annual sales of 17,998 units. The xD posted sales of 14,499 units for the year. Lexus reported December sales of 28,565 units, up 13.5 percent over the year-ago month. Lexus passenger cars reported December sales of 15,862 units, up 27.6 percent over December 2008, with year-end sales of 112,745 units, down 25.6 percent from 2008. For the year, Lexus passenger car sales were led by the ES entry luxury sedan with year-end sales of 48,485 units. The IS entry luxury sport sedan recorded combined annual sales of 38,077 units. The HS entry luxury hybrid sedan recorded sales of 6,699 units for the year. Lexus Division light trucks reported December sales of 12,703 units, down 0.2 percent from the year-ago month, and year-end sales of 103,230 units, down 4.9 percent from last year. Lexus sales were led by the RX luxury utility vehicle in 2009, which posted combined year-end sales of 93,379 units, up 10.9 percent over the prior year. The RX 450h hybrid luxury utility vehicle reported sales of 14,464 units for the year. In December, TMS posted sales of 17,964 hybrid vehicles, up 36.7 percent over December 2008. TMS calendar-year-to-date hybrid sales totaled 195,545 units. Toyota Division posted December sales of 14,317 hybrids and year-end sales of 173,655 units. Lexus Division posted sales of 3,647 hybrids for the month and 21,890 units for the year. There were 28 selling days in December 2009, compared to 26 selling days in December 2008. There were 308 selling days in 2009 and 2008.